Weighty Matters: Pretty much nobody checks fast food calories. One of the arguments that Big Food puts forward against mandatory calorie labeling is that many restaurants already have in-store brochures or online listings of calories. Ever wonder how many people look at them? Well wonder no more as a study published in the American Journal of Public Health set out to answer that very question. The study was pretty straight forward. Researchers observed 4,311 people buying food at McDonald's, Burger King, Au Bon Pain and Starbucks to see how many of them looked at those respective restaurants' in-store (but not on menu) nutritional information. 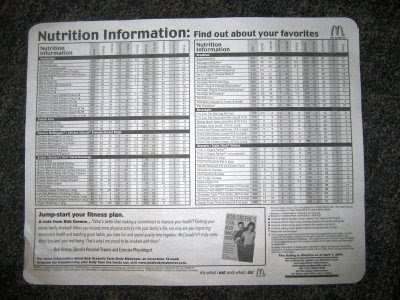 In order to be counted all you would have had to do is, walked up to a nutritional information poster and turned their head toward it, picked up a pamphlet, or touched the screen of the computer in Au Bon Pain that displays nutritional information. So out of 4,311 people want to guess how many checked? 6 out of 4,311 people - 0.1%. Guess the argument that so long as it's in-store it doesn't need to be on-menu's out the window.